Bundesliga | How does Lucien Favre's Borussia Dortmund stack up to Jürgen Klopp's title-winning version? 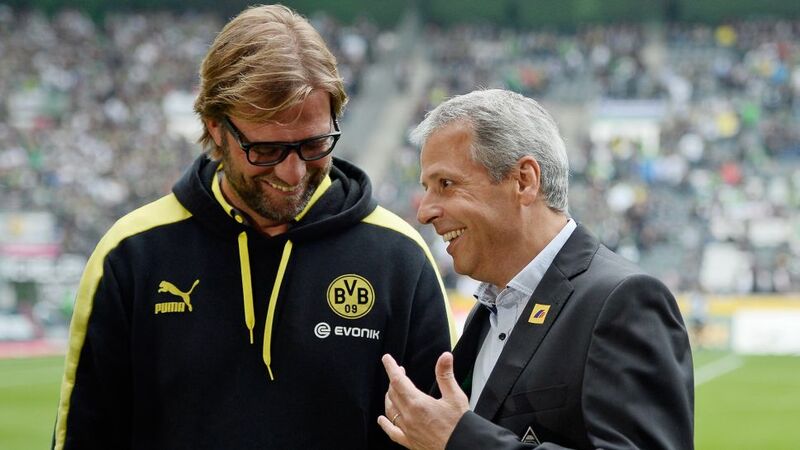 How does Lucien Favre's Borussia Dortmund stack up to Jürgen Klopp's title-winning version? A thrilling start to the season has Borussia Dortmund fans dreaming that Lucien Favre might deliver a first league title since Jürgen Klopp won back-to-back Bundesliga crowns as manager in 2010/11 and 2011/12. bundesliga.com examines the parallels between Klopp’s Dortmund and Favre’s version. An exciting full-back: Hakimi the new Piszczek? Klopp took over at Dortmund in May 2008, not long after the club had overcome significant financial trouble, and following a 13th-placed finish in the Bundesliga that season. It would take time for him to build a team good enough, but by the end of his third year in charge Die Schwarzgelben were German champions for the first time since 2002. Eight league matches into the first year of his reign, Favre has yet to taste defeat as Dortmund boss, and his side are clear at the top after scoring a club record 27 league goals to start the season. But how does his team compare to Klopp’s? One of the key recruits for Klopp ahead of that glorious 2010/11 season was a player who is still at the club today. Lukasz Piszczek, then 25, arrived at Dortmund on a free transfer after impressing while playing for a Hertha Berlin side that were relegated in 2010. Klopp felt that Piszczek, who had been converted from an attacker into an attacking full-back, could fulfil his potential with Dortmund. Sure enough, the pacy Polish international weighed in with seven assists in 33 matches during that title-winning season. Now 33, Piszczek is targeting a third league winners’ medal before he leaves Germany in 2020, and one of this season’s summer signings could help him get it. Achraf Hakimi has been sharing the workload with his elder colleague since arriving on a two-year loan deal from Real Madrid. The 19-year-old has wasted little time in adapting to German football, and got his first goal for Dortmund in the 7-0 win over Nuremberg on Matchday 5. The Morocco international can operate at right or left-back, and a couple of early assists in his Dortmund career helped him earn the Bundesliga Rookie of the Month award for September. Dortmund’s initial title push under Klopp was aided by two players whose love for the club has seen them return to BVB after spells away: Mario Götze and Shinji Kagawa. Götze made his Bundesliga debut as a 17-year-old in November 2009, but it wasn’t until the following season that he really made his mark. After five appearances the previous campaign, the future FIFA World Cup winner sat out just one game in 2010/11. Dortmund’s homegrown star finished with six goals and 15 assists, becoming a Bundesliga winner shortly before his 19th birthday. A vital creative force alongside Götze that year was unheralded new recruit Kagawa. The Japanese attacking midfielder scored against Wolfsburg in his third appearance, and completely won over the fans with a Revierderby double in a victory at Schalke a week later. A broken foot then hampered Kagawa’s progress, but - with eight goals in 18 matches - he had played an important role in Klopp’s first title win. Götze and Kagawa’s experience could prove vital to Favre this season, but for equivalents to them in the current squad how about Jadon Sancho and Axel Witsel? Newly capped England international Sancho is comparable to Götze, in that he’s a player who got a taste for things in his first year with the team before pushing on and unlocking defences at will. By Matchday 8, the 18-year-old already had two goals and six assists. Witsel – while much more established on arrival – is perhaps similar to Kagawa: an eye-catching summer signing from an Asian league who could have a major influence on his new team. Klopp had Nuri Sahin in his first Bundesliga-winning squad, and added Ilkay Gündogan ahead of their successful title defence. But in Witsel and Thomas Delaney, Favre already has two seasoned internationals at his disposal who are primed to control the tempo and win the physical battle in midfield. Whereas Klopp’s Dortmund perhaps needed the added flair and invention of Kagawa to get over the line, Witsel and Delaney have added the steel and know-how in central midfield that Favre maybe thought the current crop could do with. Klopp’s maiden title was secured thanks to the defence as much as his side’s attack, with the likes of goalkeeper Roman Weidenfeller and rugged centre-backs Mats Hummels and Neven Subotic ensuring Dortmund conceded only 22 goals in 34 matches. Paraguayan international Lucas Barrios was the club’s top scorer with 16 Bundesliga goals, but Robert Lewandowski, a new arrival in 2010, also made a telling contribution by finding the net eight times. The Polish striker made only 15 starts that year but he would finish with 25 league goals in 2011/12 as free-flowing Dortmund scored 80 goals and collected 81 points (then a record) as Klopp’s team easily defended the title. Could Paco Alcacer have a similar impact for Favre’s Dortmund? The Spaniard is certainly finding his feet quickly in Germany – averaging a goal every 18 minutes after scoring seven times in his first four Bundesliga appearances. Many of the Spaniard’s strikes have been character-building and potentially season-defining moments. He got the final two goals in the 4-2 comeback win at Bayer Leverkusen on Matchday 6 and – after coming off the bench with his side trailing again – he netted a quick-fire hat-trick in the incredible 4-3 triumph over Augsburg a week later. Will Alcacer, on loan from Barcelona, prove to be as lethal as Lewandowski when he gets fully settled in? While there are plenty of similarities between Klopp and Favre’s teams, one thing that is radically different is the environment that Dortmund are operating in. Before Klopp’s first league win, for example, there had been three different German champions in the previous four seasons. Since the current Liverpool manager’s second championship success in 2012, Bayern Munich have won the Bundesliga six times in a row. Their squad is packed with World Cup and UEFA Champions League winners, and also includes two former Dortmund heroes in Hummels and Lewandowski. In that sense, Favre’s first season would have to be very special indeed if he is to emulate Klopp by winning the title. “I know how great the hopes are,” the former Hertha and Borussia Mönchengladbach boss told SportBild in August. The Swiss coach is battle hardened though, and has chosen an inspirational leader in Dortmund native Marco Reus as his captain. His squad has a good blend of youth and experience as well as depth, with youngsters like Jacob Bruun Larsen, US star Christian Pulisic and Sancho adding to an already considerable goal threat. Between Matchdays 5 and 8 Dortmund scored four or more in four consecutive games for the first time in the Bundesliga, and even Bayern’s Arjen Robben has warned that Favre’s side “mean business” and are “a real force” this season. Strong enough to win the league? Time will tell – but the early signs are good.